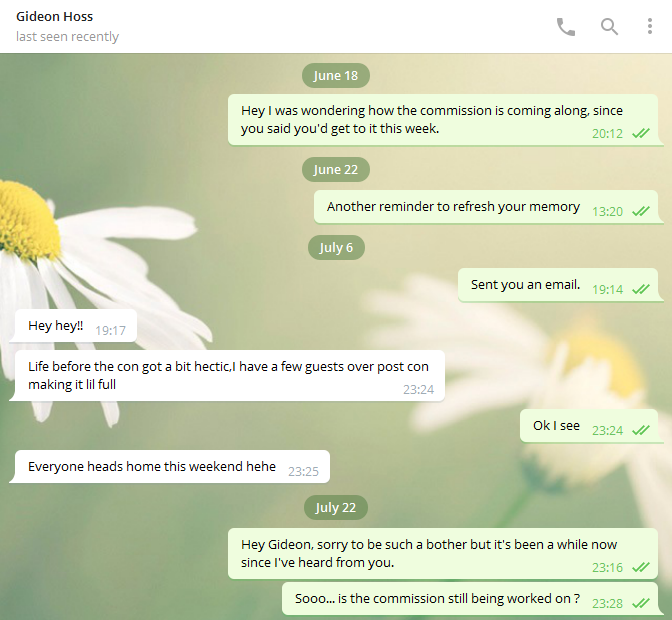 Beware - Gideon - "Artists Beware"
WHERE: Initially email, later Telegram. WHEN: Early May 2017 up to current. EXPLAIN: Mid April 2017: I contacted Gideon by email after he advertised digital versions of his art CDs on his twitter account. 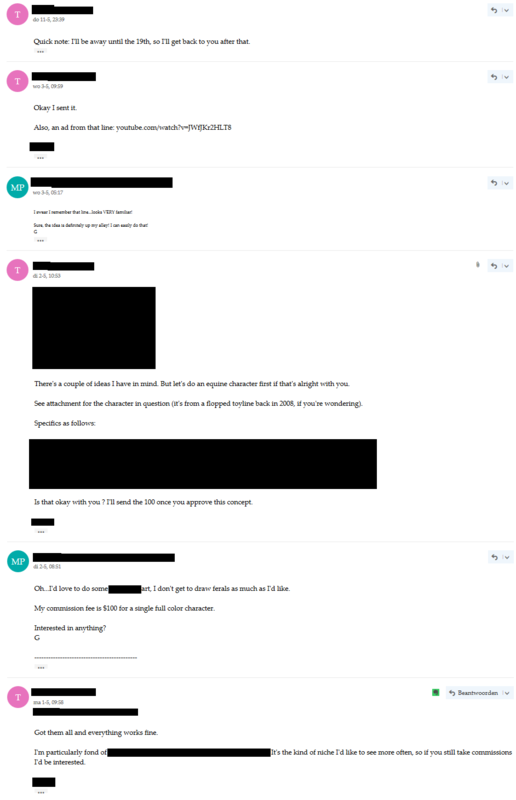 He was quick to reply and send the links after I paid through Paypal. 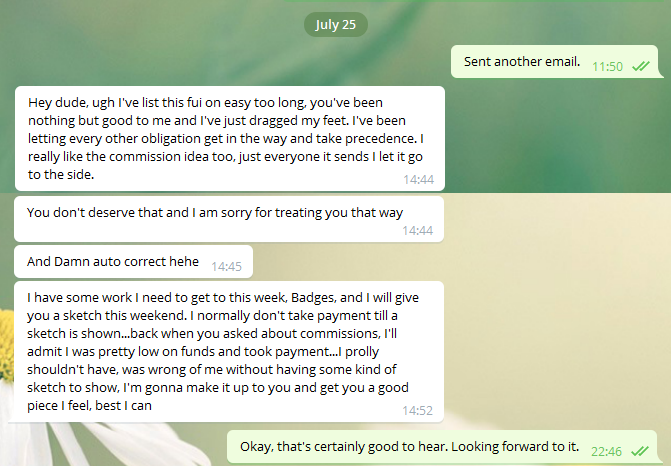 May 1 2017: I was rather fond of one design in particular and I asked him if he took commissions. He agreed for a $100 single character piece. 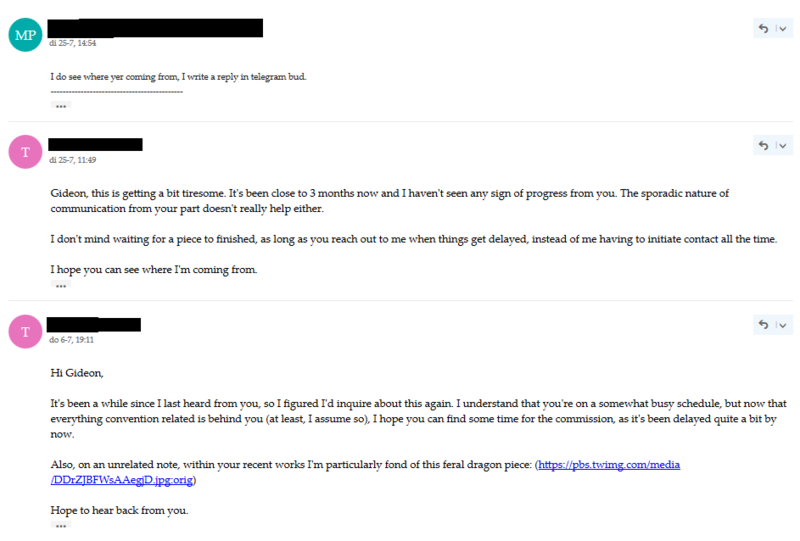 Seeing as he was quite responsive in his previous emails, that he's been active in the fandom since the early 2000s and the fact that I've seen his commissioned work occasionally on FA, I figured he would have plenty of experience in that regard and that getting a commission from him would be a safe bet. Though, at the time, I wasn't aware of this very site. 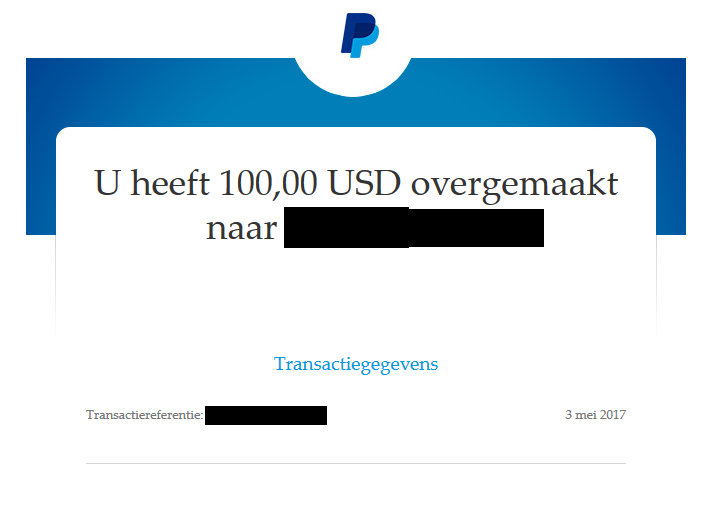 Proof of payment: https://i.imgur.com/faywzgk.png "You have transferred 100 USD to"
September 12 2017: At this point I was rather annoyed with the endeavour this whole situation had become as I had tried to contact him through email and Telegram, multiple times even, with no replies whatsoever. https://i.imgur.com/I7iX8Vw.png He was still quite active on Twitter throughout all of this however. 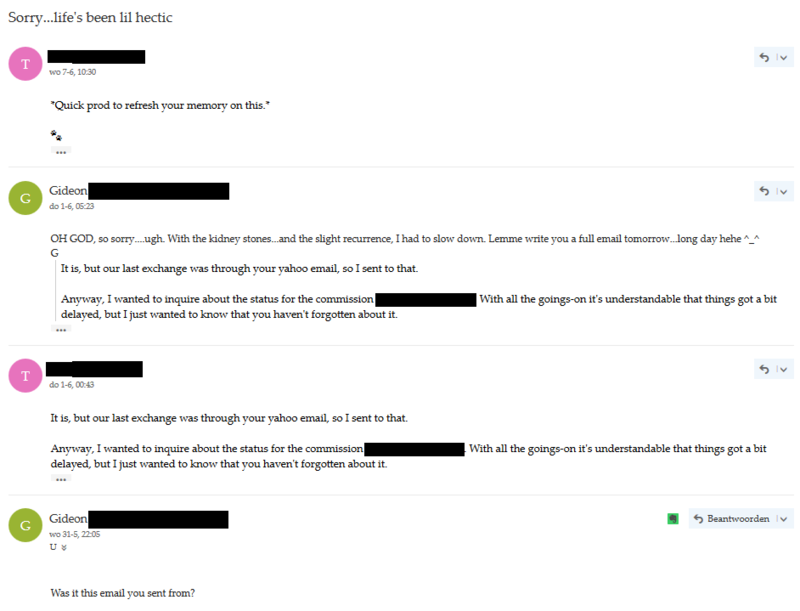 It was only when I threatened to make this public and take legal action that he got back to me. September 24 2017: The weekend had passed and I'd still seen nothing. My latest message to him is still marked as unread even though his status is "Last seen recently", which according to Telegrams FAQ means having logged in within the last 3 days. All in all, from a customer point of view I find this entire situation to be unacceptable. As I stated to him as well, I'd have no qualms with some delays on their own as long as you stay in contact and keep me updated. But when there is a consistent pattern with excuses and empty promises, as well as an overall lack of communication I'm rather skeptical on whether I'll ever see that sketch, let alone a finished piece. Paypal has a six month window now to open a dispute and issue a chargeback. Don't let this time elapse! It may be your only hope of getting your $100 back. I think you have given him enough chances by now. Considering Gideon's history, I would go this route, and fast. 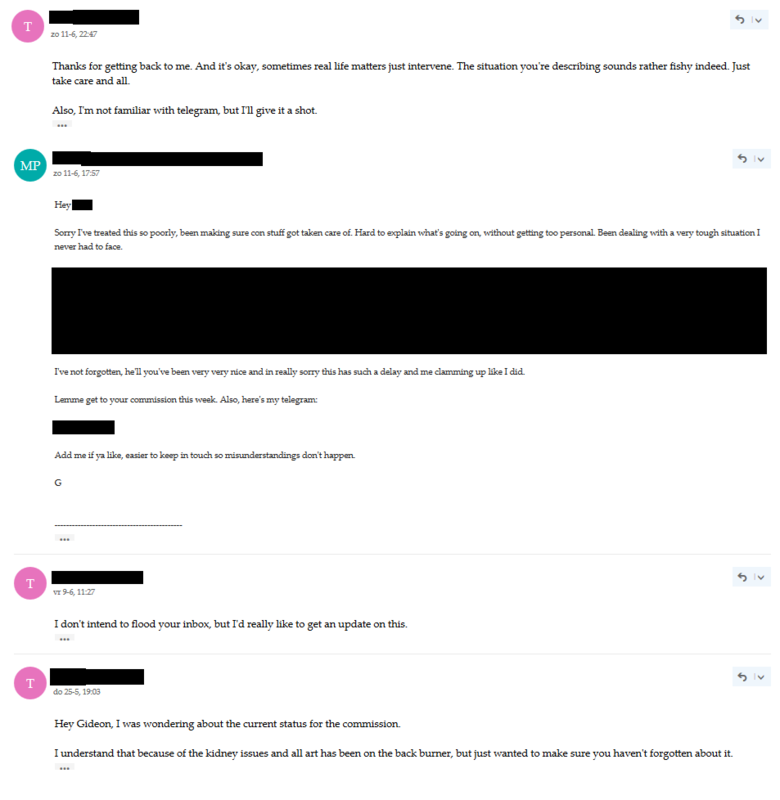 If he promises to get your art to you, don't close the dispute until you have it. Thanks. I'll look into this. Update: Gideon contacted me yet again saying he was mostly away from home and that he would scan the piece "tomorrow", which of course didn't happen. Also, perhaps I'm missing something obvious here. But when I open the dispute menu on paypal and select the transaction in question the only type of issue I can choose is "report unauthorized activity". How can I file a chargeback from here ? Odd. I just went through the same steps on one of my own Paypal transactions and was given these options: "I didn't receive an item I purchased", "I received an item significantly not as described", and "I want to report unauthorized activity". At this point your best bet is to either call in to a person at Paypal or deliberately choose the only option given to you and clarify further down the process. Good luck. I tried this again and now the option for "item dispute" was also available (not sure why it wasn't there before). However, upon selecting it I get the message: "We're sorry, but this transaction cannot be disputed because it is not a purchase of goods or services. Please contact the recipient directly." I'm starting to think I'm out of luck here. Do you recall paying via the "friends and family" option that doesn't charge fees for its use? That's the only way I can see you that message. There weren't any fees involved with the transaction so I'm afraid I did use that option. That's unfortunate. That option is not meant for business transactions (more for things like: your friend bought lunch and you need to pay them back) so it doesn't provide protection for either party. If you paid with a credit card or through your bank instead of out of your paypal balance, you can sometimes initiate a chargeback through them. That's beware worthy all on it's own, in my opinion. This is a business, and it should be run like one. Never pay using friends and family. Ever. I think if you use "friends and family" with paypal you can still contest it with your bank within a certain amount of time. Give this guy no quarter, I'd call the bank ASAP, honestly.